Britain’s Danny Kent took victories by margins never thought possible in the class, but had to fight hard till the end to be crowned king. 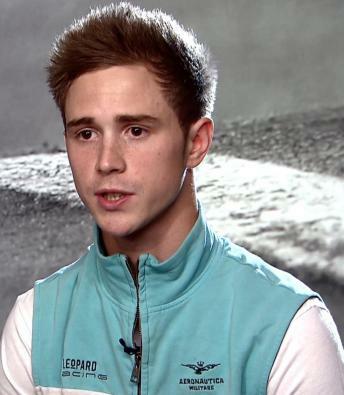 Since first debuting in the World Championship in 2010 at the British GP, Danny Kent has worked tirelessly to achieve what many only dream of: becoming a World Champion. 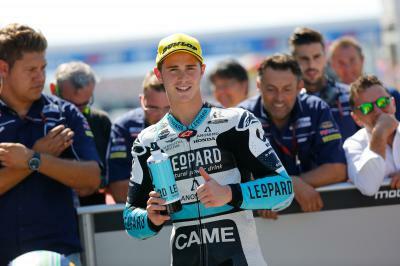 Until 2015, Kent had worked primarily with the acclaimed Ajo squad in the lightweight class, but took a gamble to sign with the newly formed Leopard Racing team in 2015. Throughout testing the pairing looked strong and as one of the most experienced riders in the class all eyes were fixed on Kent. The Qatar GP was a classic Moto3™ race, a huge group of riders all fighting tooth and claw for victory with positions traded at every corner. The top nine would end the race within a second of each other, Kent ending in third and just 0.142s shy of victory. Kent had shown intent and in Austin would show just how fast he could be. Round 2 of the 2015 MotoGP™ World Championship saw Kent dominate a Moto3™ race like none had done before in the dry. An incredible 8.5-second lead saw Kent win in Austin, the tight and fierce battles of the lightweight class replaced with a faultless ride from the Brit. The Argentinian GP soon after proved Austin was no fluke, Kent winning by 10.3 seconds and extending his lead in the standings. 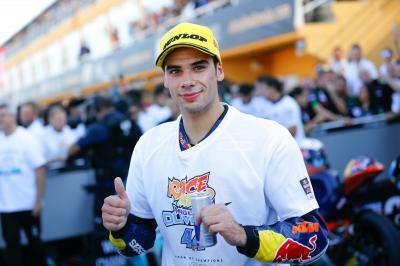 Jerez would close the field up once again, Kent beating out the Red Bull KTM Ajo duo of Miguel Oliveira and Brad Binder for the win as the trio avoided last corner drama. Moto3™ rookie Fabio Quartararo left his braking too late, narrowly avoiding Kent and the rest of the field as he ran wide after a near highside at the famous last corner in Jerez. Disaster struck for Kent in Le Mans, Qualifying saw riders get just two dry laps before the rain fell. Eager to avoid other riders benefitting from his slipstream, as had become a common occurrence, Kent waited to leave the pits but was unable to set a competitive time and the Brit started down in 31st. What followed was truly the ride of a champion, cutting through the field to fourth, his first time off the podium in 2015. Round 6 in Mugello was another typically close Moto3™ affair, Oliveira out racing Kent to win by just 0.071 seconds. By this stage of the season the Portuguese KTM rider appeared as Kent’s main title rival, but Kent’s advantage was clear. It was back to winning ways for Kent in Barcelona, holding off hard charging Italian Enea Bastianini. The rest of the Moto3™ field had caught up with Kent’s early season form, battles were close again and Assen was again tight, Kent finishing third with Oliveira first, the championship gap closing slightly. This was followed by a tough weekend in Germany, several crashes limited Kent’s track time but the Leopard Racing rider still secured pole and victory as Oliveira crashed, breaking his wrist ahead of the summer break. Two tough rounds followed for Kent, Indianapolis saw almost every Moto3™ rider pit to change tyres but Kent’s team struggled and he ended down in 21st as Enea Bastianini claimed sixth and began to rapidly reduce Kent's lead. A red-flagged Czech GP would again see Kent’s lead eaten into, with no new tyres the Brit finished seventh as Bastianini battled to second and confirmed himself as a title contender. After two difficult races, Kent lusted for success at the British GP and pushed to his maximum despite the abhorrent conditions, rewarding the British fans who braved the rain with a dominating 8.5-second victory. Unfortunately for Kent, the home crowd would boost Bastianini in Misano, the Italian claiming his first win as Kent suffered a penalty for exceeding track limits and ended a distant sixth. 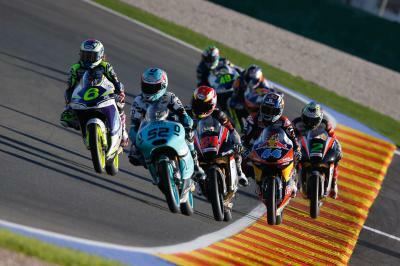 Aragon was a disaster for Kent and Bastianini, both crashing on the last lap and failing to score. Kent headed to Motegi with a mathematical chance of taking the title. Miguel Oliveira, Romano Fenati and Enea Bastianini were all in with a mathematical chance, but a a reduced race in the wet forced Kent to play it safe and wait till the Australian GP. Kent crashed out of the race as Bastianini also fell, Oliveira becoming his only title rival as they went to Sepang. Crossing the line in seventh in Malaysia as Olveiria again won, Kent was forced to wait till Valencia. 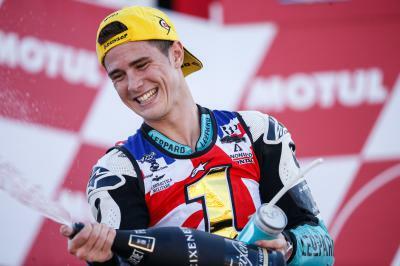 The Brit needed just two points to secure the tile in the last round, with a ninth place finish Kent was crowned the 2015 Moto3™ World Championship. Danny Kent takes his Moto3™ World Championship on his fourth attempt with a safe ninth in the Valencia GP. The 2015 Moto3™ World Championship slips through Miguel Oliveira’s but a valiant effort sees him go out in style. Re-live Jorge Lorenzo's four World Championship titles before you find out whether he can make it five at the Valencia GP. 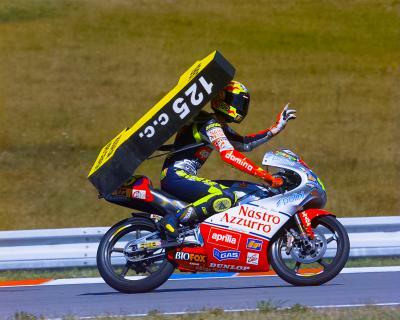 Take a look back at Valentino Rossi's nine World Championship winning seasons, can he make it a perfect ten in 2015? 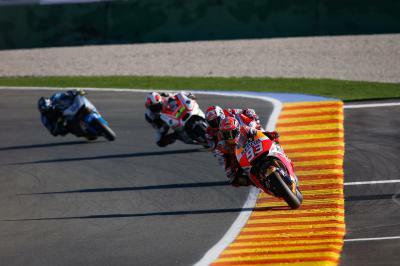 All of the vital information any fan needs to know about the MotoGP™ race at the Gran Premio Motul de la Comunitat Valenciana. Marquez set the pace, followed by Lorenzo & Pol Espargaro. All of the information you need to impress your friends about the Moto2™ race at the Gran Premio Motul de la Comunitat Valenciana. 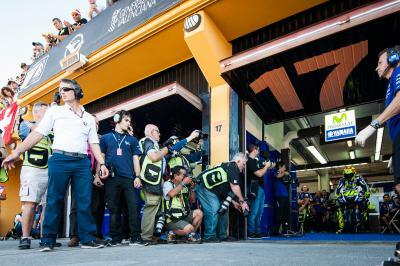 Thomas Luthi topped the Moto2™ timesheets in Sunday morning’s Warm Up ahead of Tito Rabat and Alex Rins. Here's a quick recap of where the riders stand after qualifying for the MotoGP race at the #ValenciaGP. Get all of the information you need in one place ahead of the Moto3™ race at the Gran Premio Motul de la Comunitat Valenciana. Niccolo Antonelli led the field in Sunday morning’s Warm Up ahead of Isaac Viñales and potential Moto3™ World Champion Danny Kent.